Have you ever heard of porcelain veneers? 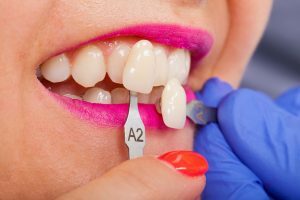 Unlike other cosmetic treatments, which tend to target a specific esthetic issue, such as teeth stains, veneers actually transform a smile’s entire appearance. They help our patients in Greenville, TX, enjoy a smile makeover. In today’s blog, we’re going to look at how we create and place these custom-made and beautiful restorations. To ensure a natural appearance and comfortable fit, we need to make room for them. We remove a thin layer of enamel, then using digital imaging technology, take detailed pictures to create a 3D digital impression. The impression allows our team to design your restoration. Which will be created from lifelike porcelain. Once we complete your veneer, we will place it with a powerful bonding material. Since porcelain can be shaded to match surrounding teeth and contains stain-resistant properties, your newly restored tooth will look completely natural. The restoration covers the front and sides of your teeth. With proper care and attention, they could potentially last for decades. You should continue to brush and floss daily, which cuts back on plaque buildup and safeguards your entire smile. You also need to have your teeth examined and cleaned. These preventive visits enable our team to monitor your new restoration, while completely removing plaque and protecting teeth (and your restoration) from decay, infection, and periodontal issues. We also suggest cutting back on sugary foods and drinks, as well as beverages containing dark pigments. Your routine habits help ensure your new veneer stay bright and strong! Once placed, we can use them to lengthen worn down teeth, repair minor chips or cracks, and reshape malformed teeth. We’ve placed them to mask permanent teeth stains, which form below the tooth enamel and may not respond to traditional teeth whitening treatments. They’ve helped close unsightly gaps between your teeth and even correct the appearance of minor misalignment. For a more cost-effective smile makeover, we may combine them with other treatment options, such as teeth whitening, dental bonding, and dental contouring. If you have any questions about improving your smile’s appearance with our cosmetic dental care, then contact our team today. We want to offer our patients a stunning smile with our cosmetic dental makeovers. We want to help our patients enjoy a stunning smile, one they’ll be eager to show off to the rest of the world. To learn more about cosmetic dental care, including our lifelike porcelain veneers, schedule a consultation with Smith Family Dentistry in Greenville, TX call us at 903-455-5750. We proudly serve patients from Hunt County, Greenville, Royce City, Sulphur Springs, and all surrounding communities.